Claude Yoder (1907 – 1991) grew up in the Amish-Mennonite community on a farm near Grantsville in Garrett County Maryland. He spent most of his adult life as a factory worker in the Cumberland area. 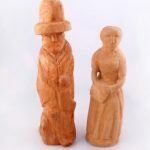 He had a lifelong passion for carving. 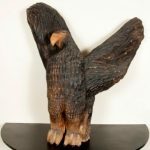 His favorite subjects were birds, animals, and people, and his favorite material was wood. He seldom sold pieces, but carved for the joy of creating. His work received national recognition and shows what art critics call a ‘technically naive but earthy sense of form and texture’. The Yoder family donated most of his life’s work to the museum. 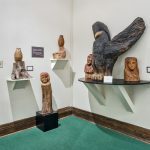 You can see the unique, fresh style of Claud Yoder’s carving at the Allegany Museum, 3 Pershing St, Cumberland MD, Tuesdays through Saturdays 10 to 4, and Sundays 1 to 4.